I used to have BP cable years ago and it was okay...am thinking about getting it again. Any atomicans using it? Yay or Nay? It really depends what you want to do on your internet connection. If you want to download large files, maybe look at ADSL if it's available. The prices on Bigpond cable are not worth it. If you know you get high sync speeds on an ADSL connection, look at ADSL. In terms of stability, I won't fault either connection. Yes sometimes one or the other goes down (very rare) but that's what you get on a domestic connection. The pricing is a bit high and I'm not signing up for a home phone service..etc just to get a discount. Place where I live has crap phone lines installed. Good thing is that I live about 500 meteres approx to the exchange. It's criminally expensive per GB, but definitely a zippy, low-latency connection. ADSL is better value, no question. 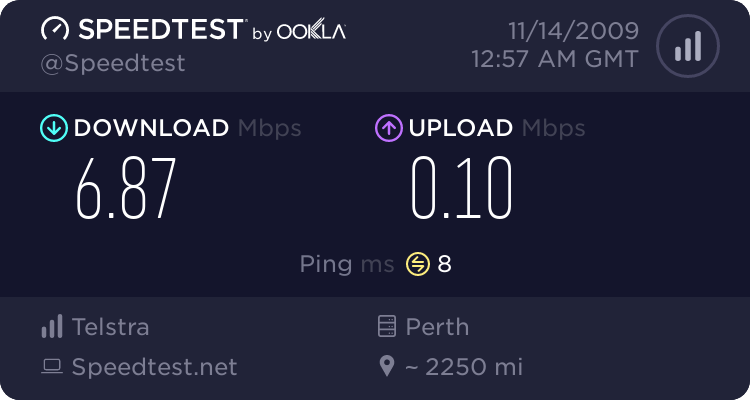 I've got Bigpond Liberty 25gb for $90 with home phone bundled, but it's the only option that I have as the phone lines around here are shot to hell. $90 for 25gb, there are much better options on the market, but as for me, I have to suffer with the stranglehold of Telstra. I use Bigpond cable and can't wait until my local exchange is ADSL2 enabled by someone other than Telstra. Then I'll finally be able to get away from Telstra. Two - Bigpond cable is expensive for the bandwidth allowances offered. Sure I prefer the speed and lowish latency but the return doesn't quite balance the cost. So - it's a good (if somewhat overpriced) service with a generally lamentable customer service record in my experience. What I dont like is I can cap myself pretty quickly if I dont watch my usage, I did used to rip BP cable off to the max before they updated thier usage meter as I also had a Usenet account and would load all my downloads up for the last few days in the month when they were only scanning every few days. Heh. I think I managed damn near 200GB in ~20 hours once, but that's been pretty severely curtailed now. Bigpond plans are getting updated soon -- likely Dec 1 this year (with almost certainly 100MB speeds for Melb :-D). Might be worth waiting until then. Gotta say though, with the price, I really don't know why you'd bother over ADSL if it's just for "general internet stuff". for me thats effing awesome, does Fuzz have linkage? Erm... I seem to recall Telstra putting out a press release a while ago saying that they'd start rolling out DOCSIS 3 cable by the end of this year, and Melbourne is the first to get new cable upgrades (due to the tech teams being based here, as well as the relatively high userbase). There are a couple of threads over on whirlpool about it, with info a-plenty. Of course, that would require a new modem and likely a new contract, and I can't say I'm all that optimistic about the plan changes actually being worthwhile. My local exchange is brimming with ADSL2+ providers. My biggest annoyance with Bigpond Cable (other than cost) is the 128kbps upload limit. Makes VPN/VNC-ing very irritating, and even little things like attaching things to emails over webmail are tiresome. I just want to see some realistic quotas for their cable users, making them relative to the competition e.g. 100gb for $90, $50gb for $49.95 etc. They might not happen, but hey, a man can dream. I've been on Bigpond Cable for something like 10 years. It was 128kbps when I started. And it would appear nothing has changed. From the plans page, there are the normal Cable plans, which are 8,000/128kbps. Then there are the extreme plans, that're 17,000/256kbps in most places, but in some areas are "high speed" which is up to 30,000kps down and an unspecified amount up. I'm guessing you're talking about those areas, which have a variable upload speed. yeah thats pretty poor value then depending on your location. Yeah, if you're in the right area, the value is suddenly a lot better, especially for business purposes. I'm in Brisbane, and it's annoying. They tested the higher speeds over a year ago and it was great. Yeah.......I'm on the Cable Extreme 25gb....sometimes I have to bounce up to the 60gb plan but it's unbeatable for speed most of the time. They did have some half price starter plans.........dunno if they're still available. The half-price deals are still around -- 12 months on a 24 month contract. You need to have a Telstra fixed-line phone *and* a Telstra mobile though.